Ever the Hunted is a charming and adventurous story with a sweet romance. Erin's writing is truly enchanting. She cast me under her spell of her beautiful, sweeping imagery and lively dialogue. I was so incredibly happy while reading that my cheeks hurt from smiling. Although plot-wise, there isn't a ton of action and it's sometimes predictable, Ever the Hunted is wonderfully executed, especially given the fact that in my opinion, it's really more of a character-driven book. Britta and Cohen's relationship—although complicated—is undeniably the core of the story. It also doesn't hurt that I happen to adore both characters. 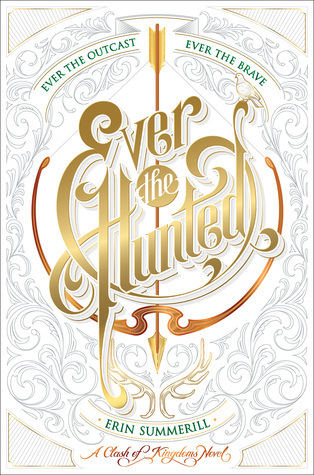 Ever the Hunted is a story that's laced with sorrow and betrayal, all of which is fantastically balanced out with an adorable romance and a rich setting. And that ending?! My god, I cannot wait to see what Erin has in store for us in the sequel! 1) Erin's writing style hooked me instantly. Her prose is whimsical and beautiful, the voices of her characters are incredibly distinct, and the dialogue is witty and beguiling. Her words truly inspired me and made me want to work harder on my own storytelling and dialogue. 2) Britta is awesome. This is a girl that the world has turned its back on, but she's a fighter. Literally every aspect of her life is the worst case scenario. Everything she loves is taken from her, but she still goes on, keeps pushing, and doesn't quit, no matter how bleak and impossible a situation seems to be—and I greatly admire that about her. 3) The world-building is wonderful and enchanting! The setting is so dazzling and picturesque—every visceral description feels tangible and real. How I wish I could jump into this book and see it for myself. 4) Britta and Cohen are SO. Freaking. Adorable. There were some times where I really wanted to bang their heads together, and other times where I just wanted to squish them and pinch their cheeks. Their chemistry gave me goosebumps and their banter made me laugh—repeatedly. What's especially incredible about these two is that you only get Britta's POV, but I still feel like I know both of them really well, and I am beyond words invested in their relationship! I haven't read any of Kristin Cashore's books so I'll have to take your word on it. I'm also a little worried about the romance because of how this book ended but I guess we'll have to see haha. I'm so glad to see you enjoyed this book! :) I've seen mainly positive things about this book, and your review seems pretty spot on to what I've been imagining. I think I can handle a little predictability and such for a great books like this! Great review! I have only seen one negative review but me and that reviewer majority of the time never agree on the books haha. I really hope you enjoy this one. Like you, I can live with a predictable plot as long as the characters and the execution are great. I just started reading this the other day...I think about 50 or so pages in and I just find myself so bored...I feel like the black sheep on this one (as usual with hyped up books, haha). I'm going to keep reading, but it just isn't grabbing me like it seems to be with everyone else. I'm really glad that you enjoyed it, though! I know a few people who felt the same as you when it came to this book. If you're not enjoying it, you should move on! Why waste time on something you're not loving? Life is too short. I'm adding this to my wishlist Britt. Your enthusiasm is infection and I'm especially interested in the lovely dialogue you keep going on about. Also a Studio Ghibli like forest? Quadruple yes! Happy Holidays. Aw thanks! I hope you love it ^_^ Happy Holidays to you too! Thank you! 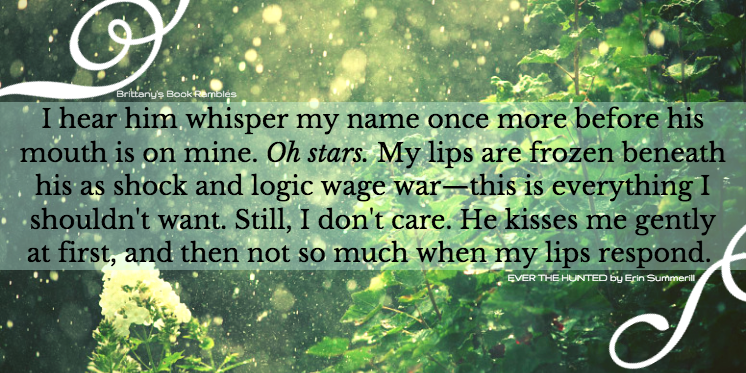 It was really easy to pick out quotes from this one ^_^ I hope you add this book to your TBR. So much love for this book around! Britta definitely is a character to remember isn't she? There are a lot of mixed feelings about this book but I think that's because it's a specific type of read that's mostly character driven. I hope that you love it though! I am really looking forward to this one so I'm glad to hear it delivered. Great review! Thank you! I hope it exceeds your expectations. Thanks for stopping by! 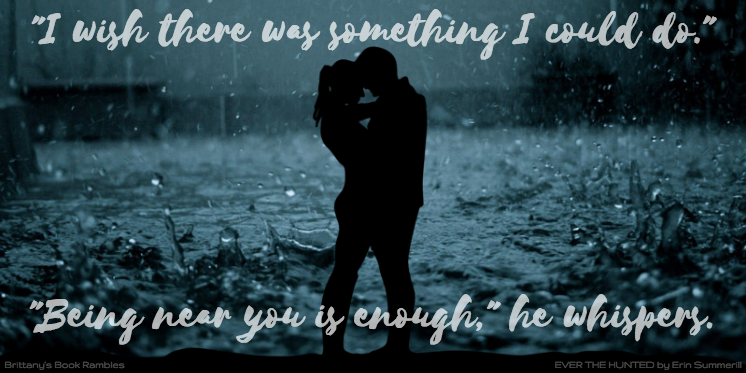 If you love a good romance I think you'll definitely enjoy this one ^_^ Thanks for stopping by! The cover is beautiful! I hope you enjoy EVER THE HUNTED!